This was such a fun story. This is my first book by Mr. Rosen and I was thrown a little bit at first by his unique writing style. Once I got into the swing of the story and Mr. Rosen’s voice I couldn’t put the book down. I was fascinated by Lucas’ journey. Plus Lucas’ quest to find love. I wound up really liking the story and enjoying the storytelling style. Lucas was so over the top in many ways, but also a typical older teen at the same time. He struggled with doing the right thing and what each decision meant for him and those he cares for. I liked how he was realistic in his thought process. You truly felt like he was telling you his story and like you were there with him on the adventure. His heartbreak was sad but I liked how he handled it. The friends Lucas made throughout the story wound up being wonderful characters as well. I liked how Lucas realized each of them were important in his life. By the end you could tell Lucas was content with his life and was excited to continue fighting crime with his Fierce Force. The suspense/mystery/intrigue plot line was fascinating. I loved all the not knowing and guessing about what happened, who was behind everything and how they would figure it out. Each of the characters play a role in unraveling the plot. Once the whole truth and plot came out I was floored how well laid out everything was. I was glad everything was wrapped up at the end. I’m not left with any lingering questions about Lucas’ past or his powers. I liked how the romance element was woven throughout the story but didn’t take over the story. It was definitely part of the whole and couldn’t have been removed all together. But it was subtle. I was definitely rooting for Lucas to find a special someone to fall in love with. By the end of the book I had a sense of pleasant hopefulness for Lucas and his future. I would love to read more stories with him, and the Fierce Force. I’m very excited for Fierce to join us today. He’s here to talk about something he struggled to overcome that he didn’t expect to have to deal with. I have to say, I had some of the same assumptions about superheroing as he did. Read and enjoy! Hello, I’m Fierce. I was raised by wolves. I have super powers—like, seriously, super. I mean, I can’t leap over tall buildings in a single bound, but I can see farther, run faster, and smell and hear better than anyone else on planet. FYI, I adore being super. I live to do good things for humanity. Also FYI, I love the press, love being on the news, love being, you know, revered. Third FYI, yes, superhero, at least in my case, equates to superego. Oh well. In any case, like I said, I’m a superhero and proud of it. Still, when I landed this job, I thought I’d save some lives, put the bad guys behind bars, and make the streets a little safer. But life, I was quick to find out, even superhero life, isn’t so black and white. I mean, to do good, I sometimes have to do bad. To put the criminal away, I might have to hurt people, even innocent people. Plus, what if I have to kill the bad guy? What if I have to put someone I know in jail? What if my powers are actually meant do evil things? Tack on trying to protect the world and my family at the same time, all while going to college, leaving home for the first time, trying to find love as I try and find myself, and you can see why my life is so utterly grey these days. FYI—last one, promise—I’d sure like a little black or white again. Just saying. 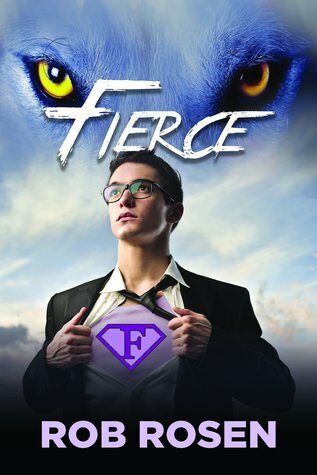 This entry was posted in Guest Post, Reviews and tagged Author: Rob Rosen, Genetic Modifications, HEA, HFN, Location: Montana, Molly Reviews, Multiple Partners, Mystery, New Adult, Rating: 4 stars, Science Fiction, Super Powers, Superhero, Suspense. Bookmark the permalink.